Which End of a Ranunculus Bulb Goes Up? Once established, brightly colored ranunculus plants require little maintenance. Plant bulbs in containers or directly in a flower bed for a bright show of color in spring. The blooms of the ranunculus make long-lasting cut flowers. Give your plants plenty of sunlight. Choose a spot in your garden that receives full sun or place container-grown ranunculus in a south-facing window or patio that gets at least six hours of sunlight per day. Make sure the plants have well-drained soil. Containers should have holes in the bottom, and garden soil needs to be light and well-drained. Ranunculus will not tolerate wet, hot soil. Water whenever the soil dries out. Be careful not to overwater. Ranunculus plants, like many bulb flowers, require no fertilization, as the bulb contains adequate nutrients for the entire growing season. Cut blooms in the early morning as soon as they start coloring. Place them in cool water with a flower preserver for seven to 10 days of color. Stop watering the plants as the flowers begin to fade. Dig up the tubers once the growth has dried out and died. Slice the tops of the bulbs off and store them in a cool, dry location for planting next year. Prepare a site in your garden two weeks before the final spring frost date. Choose an area that receives at least six hours of sun each day. Amend the soil with peat moss or compost if it does not drain well or is heavy clay. Ranunculus needs a sandy, dry soil. If the soil is too wet, the tubers the plant grows from will rot. Dig holes with a hand trowel 2 inches deep and 4 to 6 inches apart. Set the soil to the side. Place the ranunculus tubers in the holes, root “claws” pointing down. Cover the tubers with soil, tamp lightly with your trowel, and water. Water every two or three days for the first week, then once a week for the rest of the season. Apply an all-purpose liquid fertilizer once a week during the growing season, according to directions on the label. Plant your ranunculus flowers in zone 7 during the spring, when the last frost of the season occurs within a week or two. This often happens around mid-April. Amend the soil to create a planting bed that is well-draining and rich in nutrients. Turn over the top 6 inches with your garden rake or hoe, and mix in about 2 or 3 inches of compost. If the ground is frozen when you do this step, then wait for a week and try again. Plant the ranunculus tubers just below the soil’s surface with a trowel and apply ½ to 1 inch of water. The eyes (buds) should be facing up toward the top of the holes. Space multiple ranunculus 4 to 6 inches apart. Expect your ranunculus tubers to bloom later in zone 7 (usually in June or July) than they do in warmer zones. Add 2 or 3 inches of composted manure to your ranunculus bed early in the spring and cultivate it into the topsoil to a depth if about 9 to 12 inches. This will encourage more uniform flowering. Water your ranunculus about once every two weeks in the absence of rainfall throughout the growing season. Soil should remain evenly barely moist, but never soggy or wet. 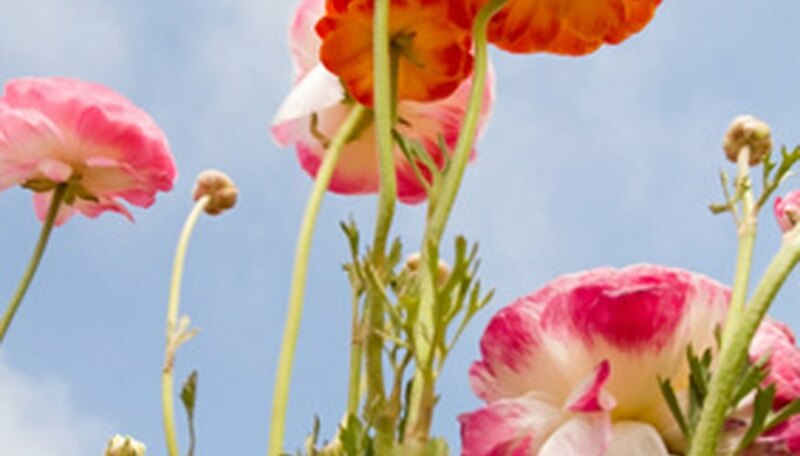 Feed your ranunculus 5-10-10 fertilizer for blooming plants every six weeks throughout the growing season. Follow the packaging instructions carefully. Well-fed ranunculus plants are far more likely to bloom prolifically and for an extended period of time than those that are neglected. Deadhead ranunculus as soon as flowers wilt and begin to drop petals. This is the single most effective action for extending the blooming period. Ranunculus asiaticus--or Persian buttercups--are showy, spring-blooming plants. Available in many colors, they have dense poppylike blooms on 1- to-2-foot stems. Ranunculus bulbs are small, with curving claws. Plant them with their claws facing down and their smooth surfaces up. 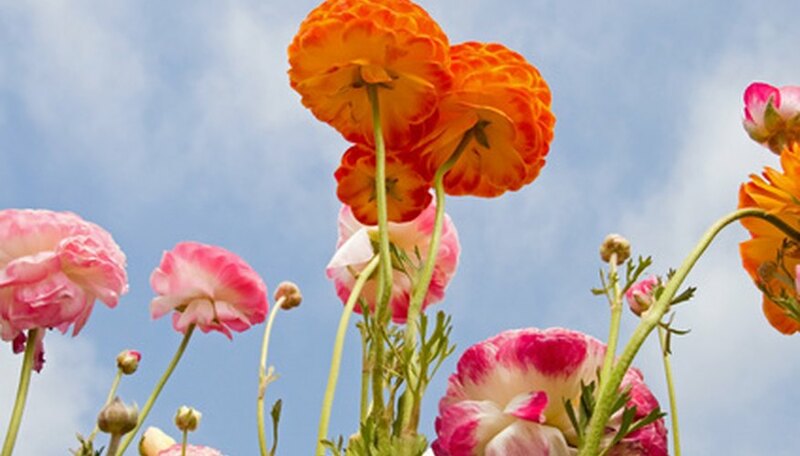 Plant ranunculus bulbs in the correct season. Plant during early spring in Zone 7 or further north, and in late fall in areas south of Zone 7. Pick a site in full sun where the soil is well-drained. Do not plant in areas where water puddles remain after rainfall. Dig a hole about 3 inches deep. Add a teaspoon of powdered bulb food to the bottom of the hole. Mix it into the soil. Plant the ranunculus bulbs with their pointed ends facing down. Plant the bulbs 2 to 4 inches apart, depending on their size. Smaller bulbs can be planted closer together than larger bulbs. Cover with soil and gently firm it down. Water well. The bulbs will begin to grow in 15 to 20 days. Mulch the area with 2 to 3 inches of hay, shredded bark or buckwheat hulls. After the flowers finish blooming, cut the flower stems to ground level but not the leaves. In Zone 7 or further north, dig up the bulbs in fall after the leaves die down. Store in mesh bags in a cool, dry place until early spring. In areas south of Zone 7, leave the bulbs in the ground year round.